Old Man Emu suspension components are perfect for those who want ride quality over 'show' quality. You may find taller or more heavily advertised suspension lifts on the market, but you will never find anything that ride more comfortably, has greater load capacity, or is more durable than Old Man Emu. 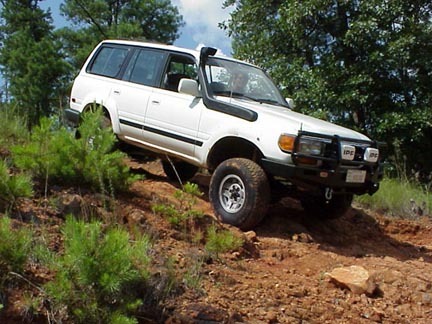 If you truly are looking for the 'best' suspension and not just the most popular or one that temporarily sits an inch taller (most lifts sag quickly, not OME), then you have found the very best suspension on the planet for your Toyota Landcruiser. 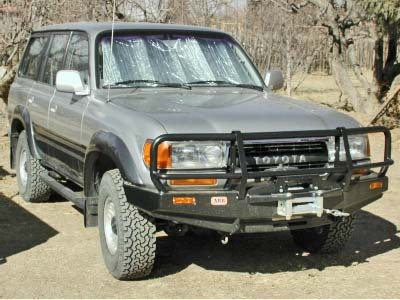 Pictured to the left is an ARB Bull Bar, Snorkel, and Old Man Emu outfitted 80 series Toyota Landcruiser. Also available from rocky Road are Safari racks and ARB Air Lockers! Please call if you have questions about our pricing policy. Hi, i have bought from your company several months ago. I finally finished my truck and i want to say thank you for your help. I am telling every person around me about your company. Old Man Emu lifts are listed below. Some folks might ask why OME suspensions are not available in taller lifts? OME's philosophy is quality and sensibility without complications. OME sizes their lifts such that there are no problems or modifications required to steering, braking, or drivetrain. Any taller and these items do become an issue. For most people, the extra inch or so isn't worth all the headache and cost necessary. Do it right the first time with OME! 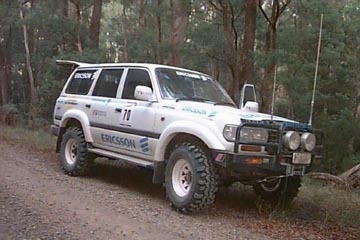 Scroll down to see some additional information on the 80 series Toyota Landcruiser lift kits. 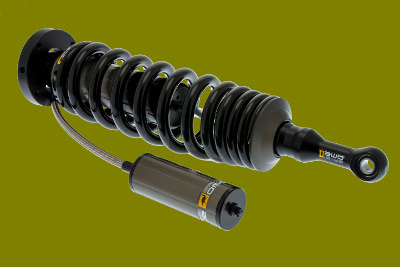 BP51 Shocks bring racing technology to everyday use. 51mm bore, 6061 grade aluminium shock absorber body with type III, hard anodised finish for increased heat dissipation and corrosion resistance. 6061 grade aluminium remote oil canister allows for increased oil volume, resulting in lower oil temperatures. Durable Dash 6 high temperature Teflon hose incorporates high flow fittings for optimum oil flow. High quality X5K grade steel coil, for use on coil over models, incorporates application specific design. Quality oversized rubber bushings result in excellent longevity. Replaceable, impact resistant, high density polyethylene shaft guard prevents damage to the shock absorber shaft from stones and other debris. Hard chromed, ground piston shaft for the ultimate in strength and durability. External, independent rebound and compression adjustment allows fine tuning of ride comfort and control to suit varying vehicle and trip requirements. Remote reservoir piggy back clamp allows easy connection of the remote oil reservoir to the main shock absorber body.